Today volunteers geared up in waders and hip boots to help us collect animals for our tanks. 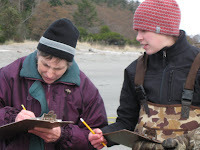 We used a seine net to help catch fish, crabs, shrimp and any other animals living in or near the eel grass beds. UNFORTUNATELY we could only do 1.25 collections. At this moment you may be asking yourself how it is possible to do a .25 collection? Well folks this is where the adventurous part of being a PTMSC volunteer comes in: While Chrissy was rowing one of the oars became dislodged from the boat and she could no longer deposit the net in the ocean....let alone row into shore! 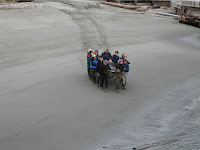 Luckily some of our volunteers with waders on were able to wade out into the water and pull her in with her oar. The fun didn't stop here though. 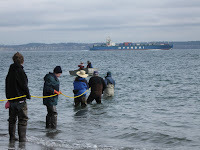 Then, as we were hauling in the net, we discovered that the net was caught on something in the water! Chrissy and our new intern Lilly jumped back in the boat and pulled themselves along the line to free up the net. Luckily they were able to free the net without tearing it. We did manage to catch a few animals today, despite the rough circumstances! 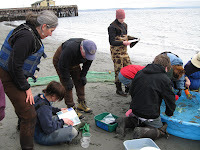 We caught a few juvenile English Soles (Flat Fish) a Graceful Crab and a Dungeness Crab. All of our tanks are up and running beautifully and we are excited to re-open in April. Our volunteers did a great job working together as a team (especially when it came time to carry the boat back to the dock)! Thank you to all of our volunteers who helped us out today. Muscles needed for gathering Mussels!